Chris “All American” Weidman just earned a title shot against UFC Middleweight Champion Anderson Silva after defeating Mark Munoz via TKO at the UFC on Fuel TV event in San Jose, California. Weidman used his superior wrestling and out-grappled the division 2 wrestler throughout the whole of the first round and early in the 2nd round, when he eventually caught Munoz with an elbow and finished off with punches on the ground. 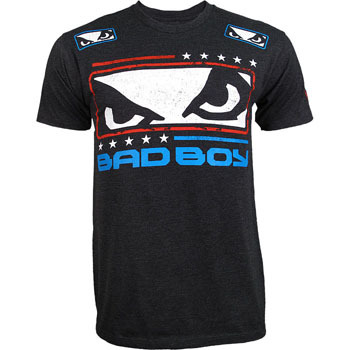 The Bad Boy Chris Weidman UFC on Fuel TV Walkout Shirt features a red, white and blue colorway which is as American as you can get, featuring the classic Bad Boy eyes and text logo on the front with an American-themed twist to it, along with the United States flag and Chris Weidman text on the back. The Bad Boy Chris Weidman UFC on Fuel TV Walkout Shirt is available at MMA Warehouse.